These chicken flavor dog treats simulate chicken pot pie. This easy dog cake recipe makes 12 dog cupcakes that will have your pet salivating for more! 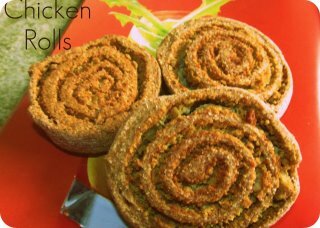 This easy dog treat recipe calls for chicken powder. 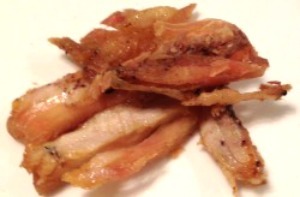 This ingredient is also known as "spray dried chicken". 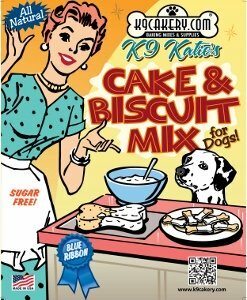 It is simply pure chicken in powdered form, which makes it easy to incorporate into a dog cake. A word of caution: make sure you buy this product from a known company. Make sure it has no added sugar, no fat, all natural preservatives, and is made in the USA. This is NOT the same as chicken bouillon, chicken stock, or other products found on store shelves. Be careful of products made in other countries where food requirements are not as stringent as those of the FDA. 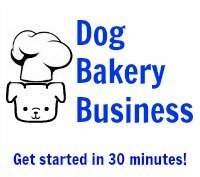 We are committed to bringing you the best all natural recipes for dog cakes and recipes for healthy dog treats. Mix up the cake mix with the oil, chicken stock, and egg. Add in the natural chicken powder and the peas and carrots to the cake mix. Stir well by hand. Bake 28-30 minutes or until toothpick inserted into the center of cupcake comes out clean. Finish with Magifrost dog treat frosting for decoration. If you want to color it, add your icing color in, then stir until smooth and creamy. Frost the chicken flavor dog treats. The roasted chicken rolls above made by Haute Dawg Treats have no additives or preservatives. Each lighter colored ring is REAL roasted chicken! These dog treats are not just chicken flavor dog treats - they are simply made with real chicken and no other ingredients. They are perfect for dogs with wheat allergies or other grain allergies. If you plan to make a lot of this type of treat, it may be in your best interest to consider an investment in a food dehydrator. Some models offer several "drawers" so that you can dehydrate different items at the same time. Cut a chicken breast into thin strips. Place on a non-stick baking pan. Bake at 200 degrees for 3-4 hours until the chicken strips are dried out. Let strips cool completely before giving to your dog. It doesn't get quicker and easier than that! Give chicken breast jerky only as a treat, not as a food source. If your dog needs dark meat chicken, chicken thigh meat can be used instead. Some dogs with certain urinary tract conditions do better with dark meat chicken because it helps to keep the urine pH in a certain range to minimize the risk of recurring stone or crystal formation. If you would rather buy dried chicken treats, please only buy products that are made in the USA. The products are regulated here as opposed to other countries where you don't know exactly what is actually going into the treat. Jerky treats made in China have received a lot of bad press, so please beware and keep your dog's health in mind at all times.